During a recent business trip to British Columbia, I found myself in West Vancouver with a short break before my next meeting. Taking advantage of the time off, I went for a stroll along the waterfront. At first I was distracted with panoramic views of the English Bay, and the Lions Gate Bridge, until I noticed that there was a guerrilla art movement happening right under my nose! 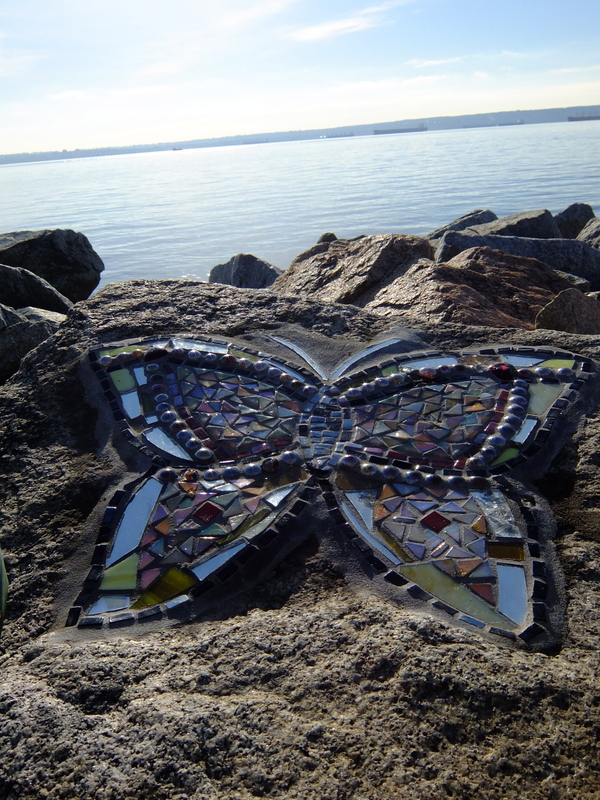 Along the path, beautiful mosaic art pieces were cemented to the rocks that lined the walkway. I have a soft spot for mosaics, so when I stumbled upon these gems, I fell in love. I asked a local about them, and she explained that new mosaics would pop up from time to time, and the older ones would sometimes wash away as the adhesive crumbled away. There were also a few non-mosaic pieces including a driftwood log painted like a crocodile and rocks stacked into unique formations. It was a real treat to discover. There was a distinct variance in artistic ability between the different pieces, but they were all beautiful in their own way. On that particular day, they sparkled like coloured diamonds in the rare Vancouver sun. Click on the thumbnails below to see the image enlarged. ← The Royal We Would Like Some Tea… Please!